Sledgehammer Games has released the first image from the 2014 Call of Duty. It tells us many things about the upcoming shooter, few of which are useful. "We can't talk at all about Call of Duty for this year," Sledgehammer's Michael Condrey said during a presentation at GDC last month. "[Activision] said you can't show anything from Call of Duty this year, and you certainly can't show in-game rendered characters from this year's game." Condrey then showed the above image from the game. A note indicated that it was an in-game character. The image was later spotted by IGN, who found the video of the presentation at the GDC Vault. The archive's since been purged of the video. Call of Duty 2014 is a modern era game, dashing our hopes of Call of Duty: Bronze Age Warfare. It stars humans, or at least aliens that appear human from the chin up. These humans/aliens have noses, mouths and eyes. Their noses, mouths, and eyes look like real noses, mouths and eyes. You're bad at the multiplayer but who cares AIRSTRIKE. The campaign can be finished in one sitting. Every review will state that while it's not a reinvention of the series, it should be satisfying to long-time fans. The campaign's story will make you feel smarter than the developers. The game's total revenue will make you feel dumber than the developers. The main character of the campaign is Sergeant Reginald Foxworth, a United States marine who has swapped brains with a Boston Terrier named French Fry. It won't have obnoxious social media integration. The game is sponsored by Samsung so all of the enemies are smug iPhone users. Activision Publishing CEO Eric Hirshberg previously stated that this game was being developed first and foremost for the PS4 and Xbox One. "Sledgehammer is approaching this as a next-gen-first development,” Hirshberg told IGN in February. "Obviously in the console-transition year, anyone who developed a cross-generational game last year had to deal with the fact that the technology of the next-gen platforms was still coming into focus and changing quite a bit during the development process…. Now that we have the next-gen hardware out in the marketplace and solid, that is our primary development." 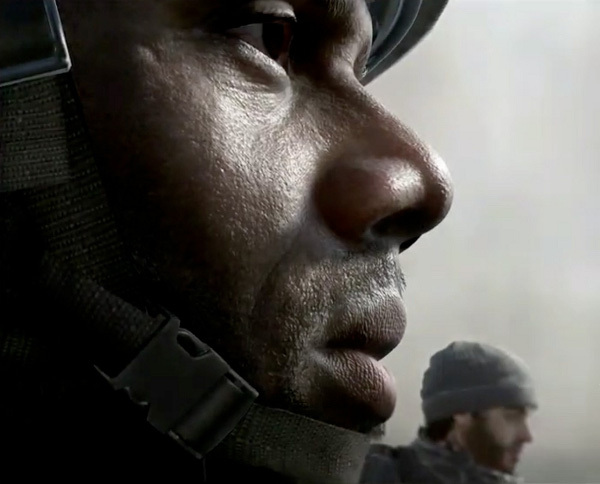 Activision typically announces the next Call of Duty in either April or May so expect an announcement soon. Presumably they'll maintain the November release date tradition as well but they haven't confirmed that. Until they do, keep staring at this virtual dude's cheek.